Today is Kitchen Joy’s 4th birthday. It doesn’t seem possible that it’s been that long since I began this project. While I hope that over the years I’ve been able to bring a little bit of joy to your kitchen, it is I who have benefited the most from this endeavor. I’ve learned so much about food. Ingredients, techniques, the how and why behind the recipes. I’ve learned how to create something from a wild idea, and to stick with it. 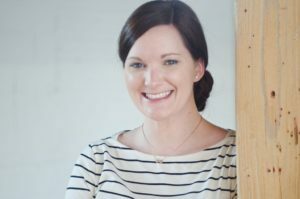 I’ve learned more about web development and computer coding than I ever would have otherwise, and gained a lot of gray hairs in the process. It’s been so much fun, and I am looking forward to continuing to work toward my goals for this site. 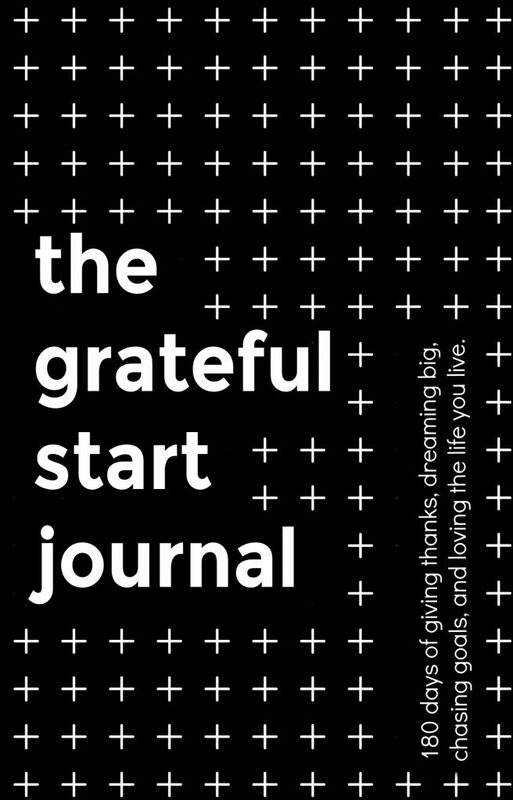 Most of all, I’m thankful. 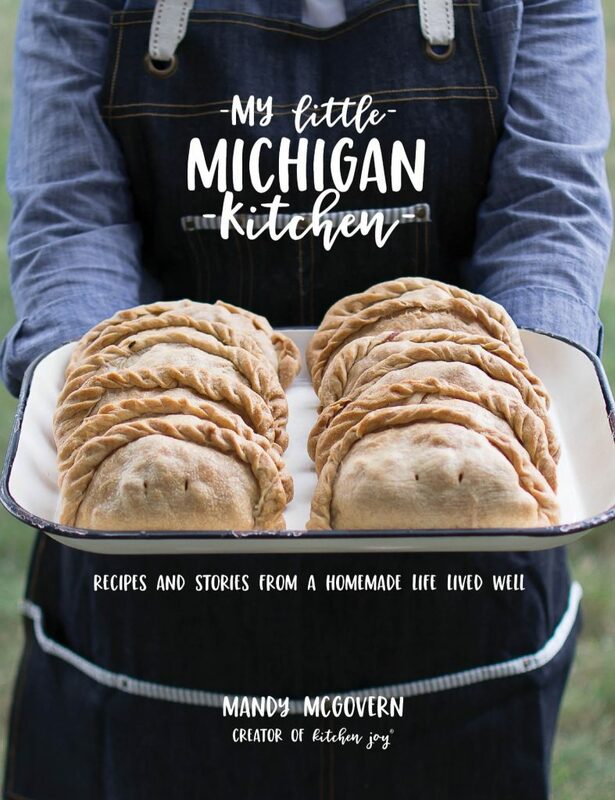 So thankful for my husband who is an amazing supporter and recipe tester, and for all those who take the time to visit my site. Every comment, page view, Facebook like, Instagram follow, email subscription, all of it means so much to me. It is only fitting that to celebrate 4 years, I needed to make a special treat. 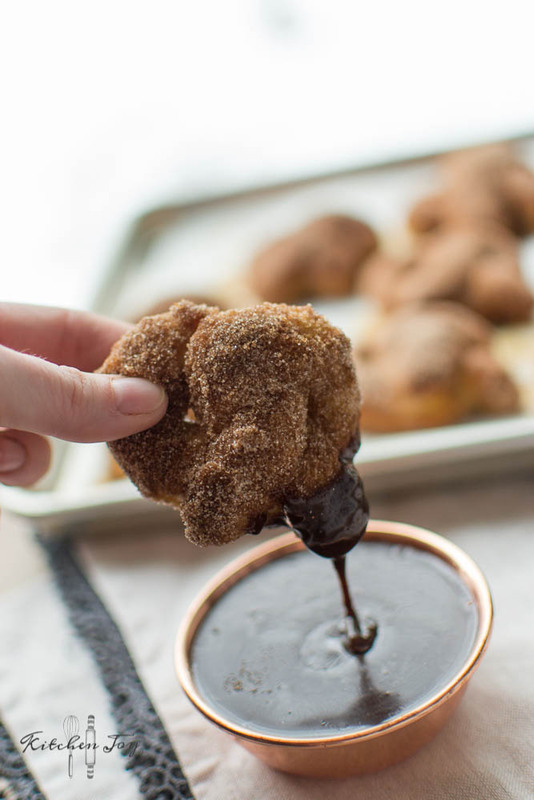 Nutella is my love language, so these Cinnamon-Sugar Soft Pretzels with Warm Nutella Sauce are perfect. 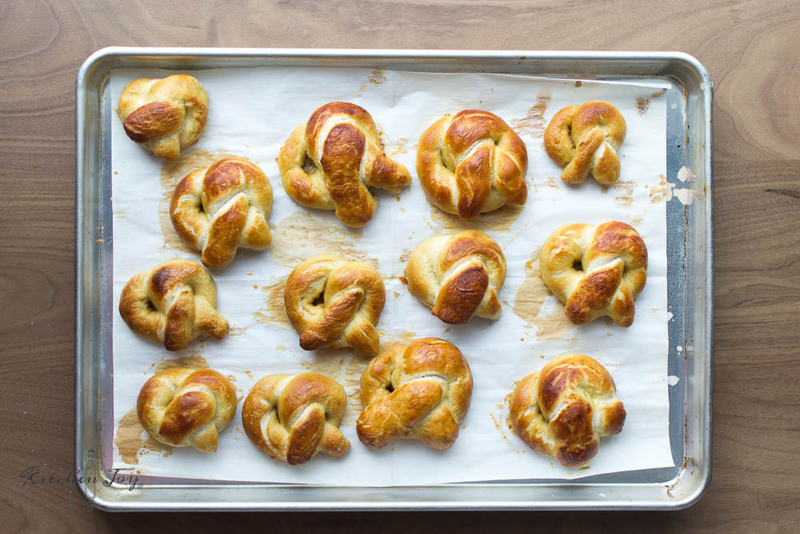 Making homemade soft pretzels is probably easier than you think. A few years ago I spent several days making batch after batch of pretzels with food-grade lye, and all the pretzel fixin’s. My results never made it to the blog because I felt that the effort wasn’t going to be worth it to the average reader. This recipe changes all that. Instead of using any specialty ingredients, you only need to use some baking soda instead of food-grade lye, which in itself is much more convenient. There’s not a lot of steps or tricky methods involved. The most difficult part is probably tying the dough into the shapes that you want, but that’s also the fun part. You can certainly keep things simple and just make pretzel rods though. I like to make my pretzels mini-sized, so I start with about an 8-inch length of dough. Feel free to get creative! Bite size are great too! Remember, they don’t have to look perfect to taste amazing. In a large bowl, whisk together the yeast and warm water. Let sit 1 minute, then add salt, sugar, and butter and whisk until combined. Gradually add flour and stir until combined. Using floured hands and a lightly floured surface, knead dough for about 3 minutes until dough is smooth and bounces back slightly when pressed. Cover and let rest in an oiled bowl for 30 minutes. While dough is resting, prepare the baking soda bath. In a large pot over high heat, combine water and baking soda, stirring until dissolved. Once mixture comes to a boil, reduce heat to medium-low and continue to boil gently. Preheat oven to 425°F. Line two rimmed baking sheets with parchment paper or silpat baking liners. Drop 3 or 4 pretzels at a time into the baking soda bath for 30 seconds. Remove with a fine mesh sieve and drain off any excess liquid. Return pretzels to baking sheet. Repeat with remaining pretzels, adjusting heat as needed to maintain a gentle boil. In a small bowl, whisk together the egg and 1 tablespoon of water. Brush pretzels with egg wash, then bake at 425°F for 12-14 minutes until golden. Melt the ¼ cup of butter in a small bowl. 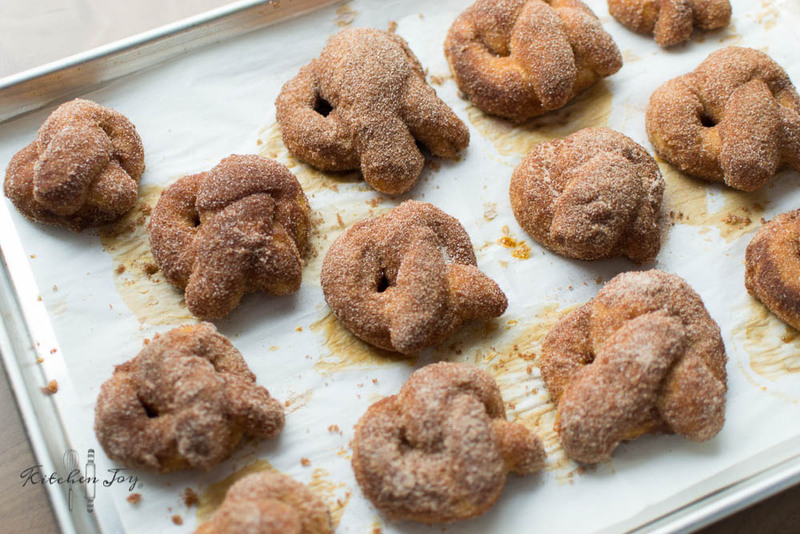 Combine cinnamon and sugar in another small bowl. Prepare the Nutella sauce. Combine Nutella and heavy cream in a microwave-safe bowl. Microwave for 45-60 seconds, stirring every 15 seconds. Serve immediately. 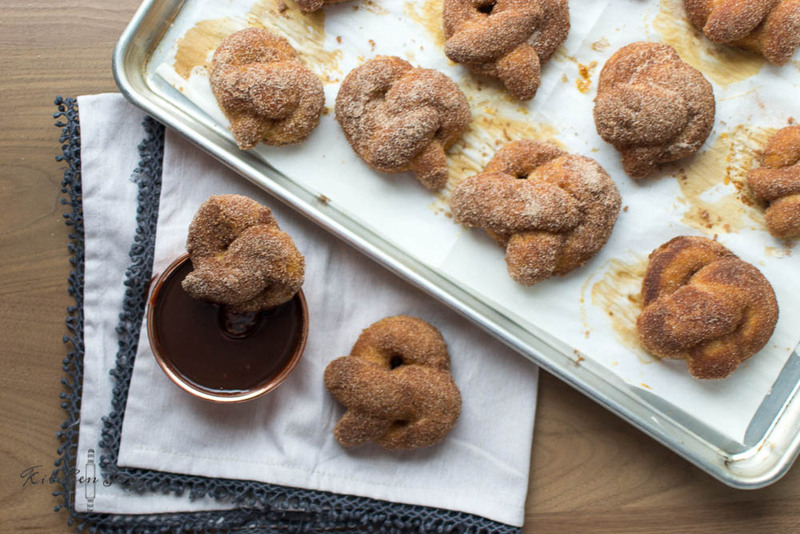 **Note: For best results, dip pretzels in butter and cinnamon-sugar the same day you plan to enjoy them. If you would like to save some for another day, store baked uncoated pretzels in an airtight container. 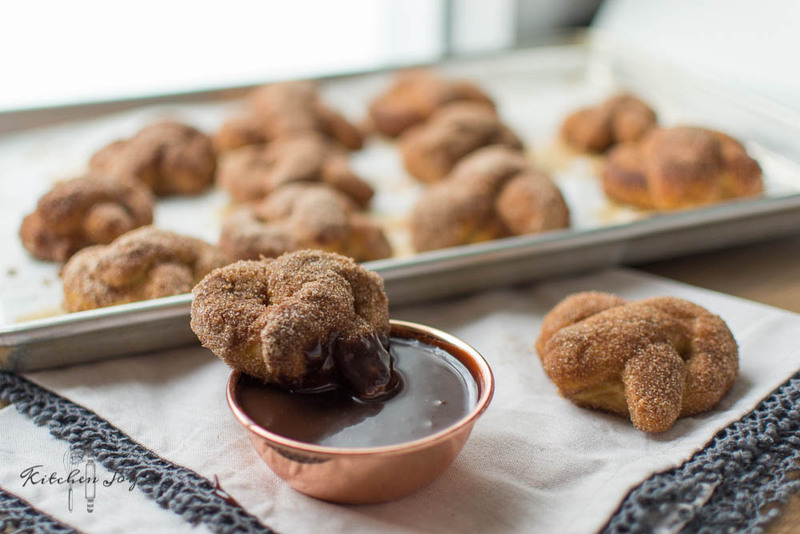 Warm the pretzels in the oven for a few minutes and then proceed with the butter and cinnamon-sugar coating the day you’ll be enjoying them. The coated pretzels do not keep well overnight because the sugar dissolves and turns very messy. 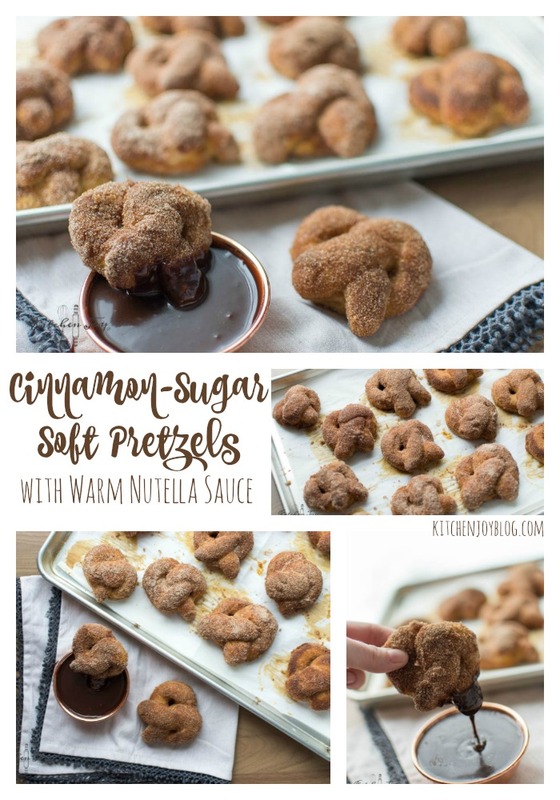 Cinnamon-Sugar Soft Pretzels with Warm Nutella Sauce first appeared on Kitchen Joy. Thanks so much for 4 years of fun! I am looking forward to continuing to share recipes that we love.